While our simple system served as a good example to help convey some basic concepts, it’s also a good illustration of one of the problems that can arise during system design. You can see that the 10-day lowest low actually cross above the 28-day simple moving average. The signals are now crossed, with the exit signal above the entry signal, and clearly on the wrong side of the market. The stage is now set for an entry to occur when an exit is already signaled for the same bar. Wrong Side is a condition that exists when the exit is literally on the wrong side of the market. This means that either (a) the exit stop for a long trade is above the long entry price, or (b) the exit stop for a short trade is below the short entry price. In the case of a long trade, the exit doesn’t have to be above the entire price bar for a wrong side condition to exist; it only has to be above the entry price. Likewise, in the case of a short trade, the exit doesn’t have to be below the entire price bar for a wrong side condition to exist; it only has to be below the entry price. As we saw in the previous example, Mechanica disallows entry when the exit signal is on the wrong side of the entry price. But the existence of crossed signals alone will not prevent Mechanica from entering a trade. If the signals are crossed and the price bar on a potential entry day has already hit or penetrated the exit stop...but the exit stop is below the designated entry price for a long trade (or above it for a short trade), then Mechanica will take the trade, and exit as instructed at the stop price...on the same day. The conditional statement above tells Mechanica to go long at the opening price on Nov-25-1997...regardless of any other condition. As you can see on the signal chart in the corresponding worksheet, price has already penetrated the exit stop on the day of entry. 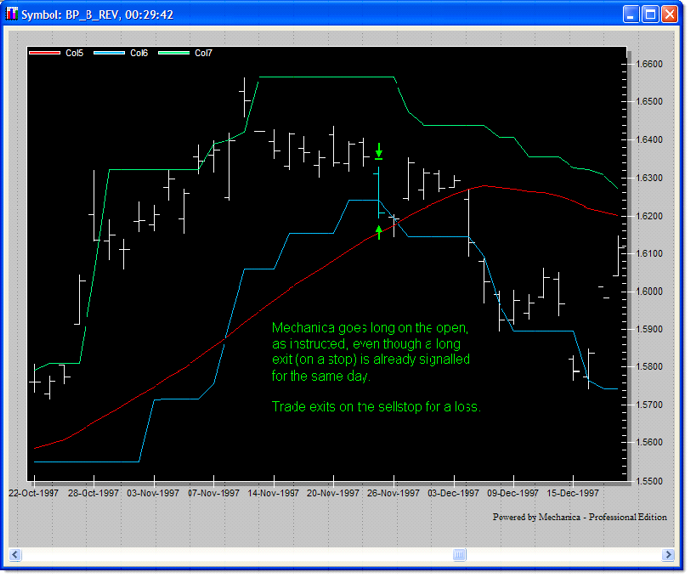 Mechanica enters as instructed, and exits the same day on the sellstop, at a loss. 1. 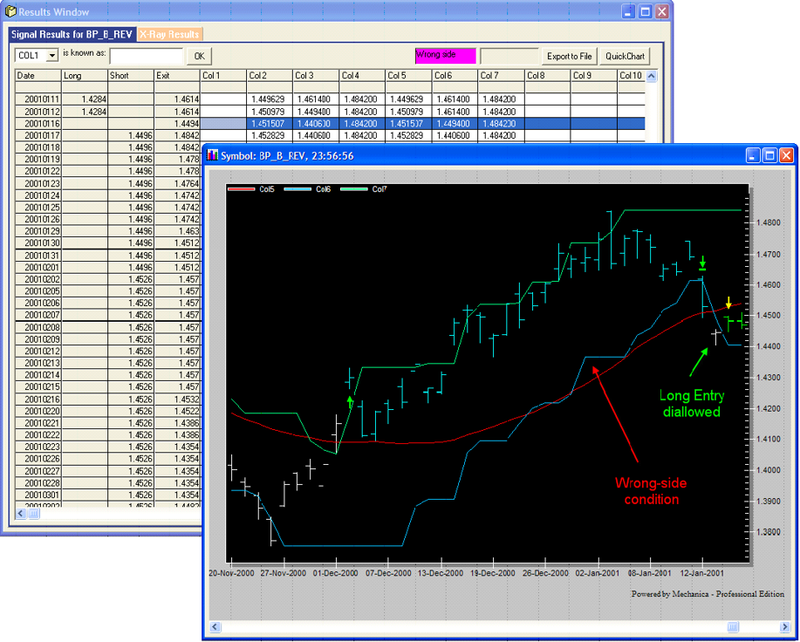 In order for Mechanica to issue a formal wrong side status message (see “Position Status and Exit Status fields” in Lesson 3 for more info), an entry must be signaled on a day when (a) the exit for a long trade is above the long entry price, or (b) the exit for a short trade is below the short entry price. 2. Well-designed systems will not generally produce wrong side conditions.